For a country that crows daily of its multiculturalism, and that is in good part comprised of a long-established and growing Chinese population, it’s perhaps telling that Australia has produced few collections of contemporary poetry from China. Some of those are Otherland Literary Journal, and Vagabond Press’ Asia Pacific Poetry Series. Prolific Australian writer and translator Ouyang Yu has often spoken of his “frustration with Australia’s parochialism and insulation as well as its cultural narrow–mindedness”, and of a desire “to bring something new into this often stifling and strangling…cultural and literary environment” (23-24). Most Australian readers have had little exposure to the rich terrain of contemporary Chinese poetry; nor would they be aware of its turbulent inception in breaking from, and defining itself against both the deeply embedded traditional strictures of Classical Chinese poetry, as well as the repressive political conditions of the post-war period that “in mainland China…pressed [poetry] into the service of the state” (Lupke 1). 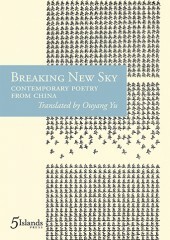 Breaking New Sky, a new collection of poems selected and translated by Ouyang, presents work from forty-six established and emerging Chinese (including Taiwanese) poets, born predominantly between the late 50s and 80s (though some as early as 1913 and as late as 2002). The collection’s title – a play on the Western idiom “breaking new ground” – connotes innovation, originality, and also risk. It embodies contemporary Chinese poetry’s iconoclasm, as well as Ouyang’s desire to introduce “something new” into the Australian literary landscape. The title itself “breaks new ground” by reinventing the hackneyed metaphor. This points to the possibilities of Ouyang’s primary translation technique – “direct translation”: a process where “words or expressions” are translated “as they are in the original, not as they are matched with something roughly equivalent in the target language”. In Bias: Offensively Chinese/Australian, Ouyang writes “it is in this process that new meanings grow on the carcasses of the old stereotypes” (139). Indeed, many of the poems in Breaking New Sky gently challenge, stretch, and vivify English. We see this in off–beat, often unexpectedly beautiful, apt, or playful phrases and images, such as: “The sky is so blue / it does not allow people to be too greedy” from “The Orchard” by Hu Xian; or “Your heart… / A street, laid with black stones, towards the evening” from “A Mistake” by Cheng Chou–yu; or “an ant / fell in love with you last year” from “Possibly” by Qi Guo, to name a few. Sometimes the poems also sit oddly on the page, on the tongue, in the imagination. They ask you to question how English holds and generates ideas. 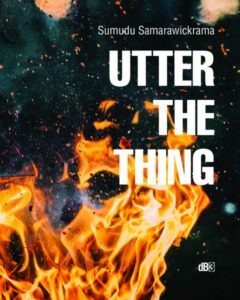 The translations’ generally plain, understated English lends cohesion to the multiplicity of voices. Though a handful of the poems might be classified as conceptual or more political in nature, most pivot around personal and domestic issues and scenes. Tone is seamlessly rendered in many to generate ambiguous or manifold implications, notably in the collection’s deceptively simple opening poem “Lamps” by Ai Hao. In “Lamps” an almost whimsical sense of urban interconnectedness is engendered when lamps light up from the bottom to top floor of a building in answer to a door “shut with a thud”. But the image soon turns on its head: no one emerges or moves between the floors, and the poem concludes, “It is just a cluster of lamps sensitive / To the sound”. Despite the poem’s clear-cut imagery, the reversal is ambiguous: is the final sentence a statement of fact or a wry metaphor? Has technology assumed the place of people in a parody of human connection and responsiveness? Or are people as isolated as pieces of technology, lacking genuine contact and relationship? The poem’s ambiguity, however, extends deeper; the omission of certain details (what type of building it is, the time of day etc.) allow for myriad permutations: perhaps it’s an office block, after hours, and a draft has blown closed the stairwell door. If one considers China’s “ghost cities” – massive (and expensive) urban developments, sitting empty, unused – the resonances of the poem morph entirely. In her essay “On English Translation of Modern Chinese Poetry” Michelle Yeh discusses this particular feature of modern Chinese poetry: through “syntactic ambiguity…a quick succession of images [is presented] that blur[s] the line between reality and imagination by intermingling what seem to be literal descriptions with metaphors.” Looking at the poem “Autumn Window” by Bian Zhilin, Yeh asks “Is the twilight on the gray wall like a tuberculosis patient or is it the other way around?” (281-282). Whilst we see this “intermingling” in “Lamps”, the poem presents in English as syntactically spare, clean; other poems in the collection, however, occasionally struggle to acclimate to English’s more rigid, inflected mode. An especially intriguing aspect of this collection is the fusion of lyric and nature poetry. Often the boundaries between the human body/experience and the land become blurred. We see this in poems such as “On the Balcony” by Lu Ye, where the speaker watches the Yangtze from her balcony, which mirrors “another Yangtze that originates in [her] heart, running / through [her] body”. The repeated motif of “the sandbar in the heart of the river” reverberates in references to the speaker’s own heart, “my heart is happy, dizzy”, and implicates her experience of love in the landscape. We see the interchangeability of the land with her body when she observes: “My windows all open towards June and the viscera / of the summer exposed / The summer in my body happens to be lush with water grass”. By the end of the poem, land and body aren’t simply mirroring each other, their boundaries have become ambiguous, enmeshed: “…my heart is the origin of Mount Geladaindong / My veins meandering for 6,300 kilometres”. Poems in the collection also explore prescriptions of femininity and masculinity. Whilst Ouyang states in the introduction that “[t]he poetry of Chinese women poets that [he has] encountered is more lyrical than political and that is where their power lies”, adding that “in a woman poet’s hands…we detect a tenderness” – it would be reductive to dismiss the deeply political implications of Lu Ye’s poem “B–Mode Ultrasound Report, Gynecology Department”, and how it delicately unhinges stereotypical associations of “tenderness” with women and their bodies. Given the immense sociocultural pressures associated with, and the policies (worldwide) that seek to exert control over women’s bodies, any work exploring these issues is a political one. Lu’s poem measures the weight of personal longing as well as external and internalised socio-cultural expectations to bear children, against a body that is unable to match them. In the poem, the speaker’s uterus is her singular defining feature, her “final file”, “the most vital part of a woman”. More than this, responsibility for its ability (or inability) to bear children is subtly transferred to the speaker, indicated by her gynaecology report which is like “the remarks on a student’s performance at school in the old days”, also pointing to the way women are talked down to about their own bodies. Lu destabilises the authority of the cool, “accurate and submissive” figures of the report by musing on how it would sound if it were written in “figurative language”, and goes on to describe her uterus’ shape as “closer to a torpedo / Than an opening magnolia denudata” – the image of the torpedo connoting power, as well as destructive force. Its force, ultimately, is turned in upon the speaker, as “this church of love” has become the “ruins of love”. The hyperbolic metaphor of her uterus as “this other heart” reiterates the value assigned to a woman’s reproductive capability: a person can’t live without a functioning heart, though a woman can happily continue living if she’s unable to have children. At the end, we see the way these pressures and expectations have divorced the speaker from her experience of her own body: “This other heart, an organ the most solitary and empty in the body / Ah, instead of being a house, an old garden, it often feels homeless”. It is impossible to do justice to such a diverse collection in so short a space. To quote Afaa Michael Weaver, “Contemporary Chinese poets emerge from centuries of poetry, much of it attuned to the art of living, of observing human and natural circumstance with a singular concision in the language, of bringing eons of meaning to a single lift of a tea cup to the lips” (xii). Interpreting this richness and deftness through the technique of direct translation, Ouyang offers us a collection that at once speaks to and unsettles our familiarities, drawing us into a dialogue with contemporary Chinese voices. Lupke, Christopher. “Introduction: Towards a Chinese Lyrical Modernity.” Ed. Christopher Lupke. New Perspectives on Contemporary Chinese Poetry. New York: Palgrave MacMillan 2008. 1-8. Ouyang Yu. Bias: Offensively Chinese/Australian – A Collection of Essays on China and Australia. Kingsbury: Otherland Publishing, 2007. Weaver, Afaa Michael. “Forward: Muddy Rivers and Canada Geese.” Ed. Christopher Lupke. New Perspectives on Contemporary Chinese Poetry. New York: Palgrave MacMillan 2008. ix-xv. Yeh, Michelle. “On English Translation of Modern Chinese Poetry: A Critical Survey.” Ed. Eugene Eoyang and Lin Yao-fu. Translating Chinese Literature. Bloomington: Indiana University Press, 1995. 275-291.